Easy Chicken Marsala is the best Chicken Marsala recipe. It tastes better than most Chicken Marsala you are served in restaurants and it’s simple to make. When you cook at home, you control the quality of the ingredients and you know you are eating something fresh. This Easy Chicken Marsala is so good, your friends will think you are Italian. Easy Chicken Marsala. Plate by Elizabeth Krome, potter. Hi. It’s Lois at Recipe Idea Shop, telling you how to make Easy Chicken Marsala. I found this recipe on She Wears Many Hats. It is scrumptious and super easy. I made ours gluten free and used chicken tenders and it took less than 30 minutes. (Cue the Italian Opera music.) Don made it recently and he used boneless chicken breasts, cut thin and pounded to tenderize. It was amazing. I love it when a man cooks for me. Buy it today on Amazon. I served it over Schäar’s gluten free spaghetti noodles, which I found to be rather tasteless, so next time I’ll go back to the usual brand I buy, gluten free Bionaturae Organic Penne Rigate . 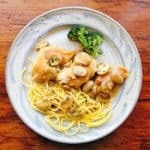 It is made with rice, potato and soy and has the taste and texture of regular pasta. Chicken Marsala is one of my favorite Italian entrees. Now that I’ve made it at home a few times, I’ll be making it on a regular basis (but not too often because it’s high in fat, calories and salt). If you need to be gluten free, it would be risky to order it in a restaurant, since the chicken pieces are dredged in flour before cooking. But since it’s super easy, you can now make it at home using gluten free flour (I think Bob’s Red Mill 1-to-1 Gluten Free Baking Flour is the best). For this recipe, I used a knife (my preference is a chef’s knife), cutting board, measuring cups and spoons, a small rectangular baking dish, and a skillet. What would you use? Go ahead, check out the recipe for Easy Chicken Marsala. Then make some tonight! Sprinkle salt and pepper over chicken tenders. Put 1/3 cup gluten free flour in a flat dish and dredge the tenders through it, coating on both sides. Heat 1 tablespoon oil and 1 tablespoon butter in a skillet over medium-high heat. Add chicken, and sauté until golden brown on both sides (turning once), about 5-6 minutes. Transfer chicken to a plate and set aside. Add 2 tablespoons oil and 2 tablespoons butter to the pan, then add sliced mushrooms (make sure they are dry) in a single layer and cook over medium-high heat until golden brown, about 6-8 minutes. Transfer mushrooms to the plate with the chicken, and again set aside. Add remaining 1 tablespoon of oil and 1 tablespoon of butter to skillet and when hot, add minced onion, cooking until soft, about 1 minute. Add the minced garlic to the pan; stir. Stir in remaining 1 tablespoon flour and cook for about a minute. Add Marsala and chicken stock; continue to cook, stirring and scraping bottom of pan until slightly thick, about 2-3 minutes. Add remaining butter and stir to combine. Return chicken and mushrooms to skillet; cook for about 2 minutes until heated. Serve over pasta and garnish with fresh chopped parsley or chives. Note: Many of the links included throughout Recipe Idea Shop are affiliate links, which means if you follow them and you buy something, we will get a small commission. It doesn’t cost you a penny more, and you can still use your Amazon Prime (Shop Amazon – Give the Gift of Amazon Prime) account to buy. This posting includes affiliate links. 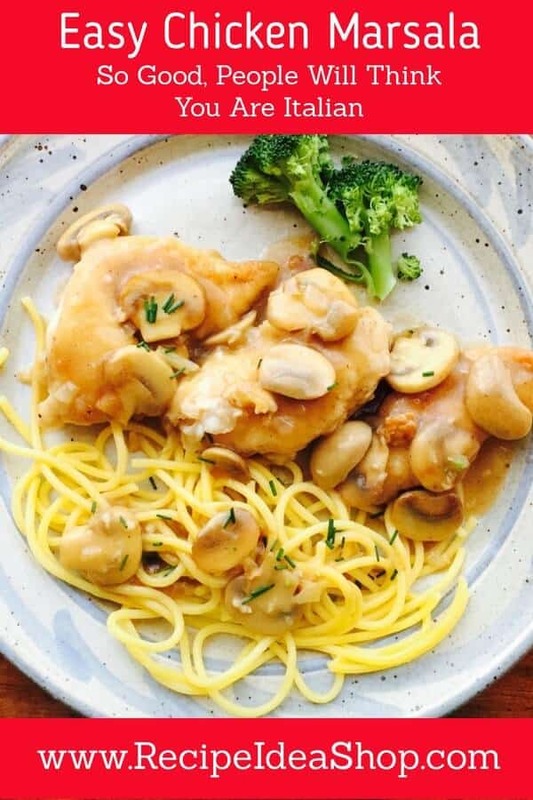 Easy Chicken Marsala Nutrition Label. Each serving is 2 chicken tenders, 2 ounces of mushrooms and about 1/4 cup sauce. Trust me, you’re gonna love this recipe. But don’t stop there…subscribe to our email newsletterand get a free cookbook. Please Pin and share our recipes. And tell us what you think in the comments. BEFORE YOU GO, DID YOU GRAB YOUR FREE COOKBOOK? Don & Lois Crawford in the kitchen at Recipe Idea Shop. 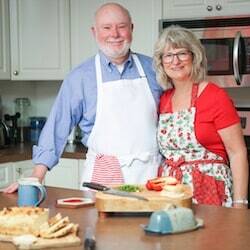 We are Lois & Don Crawford from Harrisonburg, Virginia. We love to cook. Take a look around and let's start talking about food. Read more of our story in About. 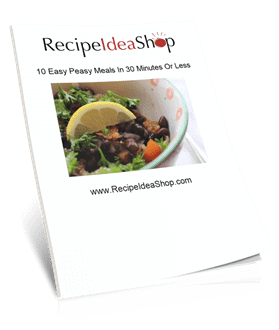 Did you get your FREE Cookbook? All content and graphics ©2010—2019 Marketing Idea Shop, LLC. We are a participant in the Amazon Services LLC Associates Program, an affiliate advertising program designed to provide a means for us to earn fees by linking to Amazon.com and affiliated sites. Please read our Full Disclosure.